SendGrid reqires you to have a domain and confirm yourself as a domain owner. The sending address must belong to this domain. For example, if you want to send emails from name@site.com you must confirm yourself as the owner of the site.com. You will need to confirm the account by clicking the link in the email that the service will send you. Start by going to https://sendgrid.com page and picking your plan, and filling out the account properties as requested by the service. Once confirmed you can login to your account, click API keys, and create a (named) API key. 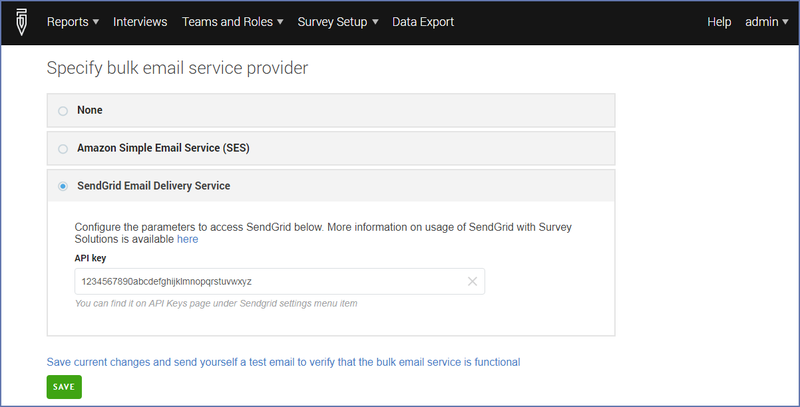 The API key is exactly what Survey Solutions is expecting from you to be entered in the Email Provider Settings dialog. The API key will only be displayed once, you can delete an existing and create a new API key at any time.